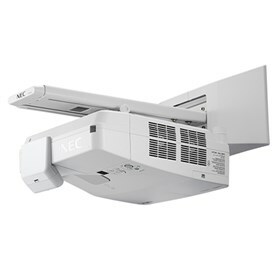 The NEC NP-UM361X-WK is a 3600-lumen ultra short throw projector with NP04WK1 wall mount kit. A complete interactive projector solution can be created using the optional NP03Wi interactive system (dual pens) with auto calibration. This model helps to eliminate the shadows and glare typically found with standard projection systems. The horizontal and vertical keystone adjustment or cornerstone correction ensures the image will fill the screen every time. The NP-UM361X-WK includes a powerful 20W speaker, closed captioning and RJ-45 for remote management over a network. Its input panel includes dual HDMI, VGA and a microphone input to amplify the presenter’s voice. The projector has keystone correction technology, sleep timer and microphone input. It also features USB viewer, advanced AccuBlend, AutoSense and variable audio-out. The NEC NP-UM361X-WK has many exciting features for users of all types. You can extend the lifetime of your NEC NP-UM361X-WK with the purchase of a FactoryOutletStore Factory Protection Plan. The NEC NP-UM361X-WK is sold as a Brand New Unopened Item.